I’m in Vancouver for a visit with my daughter and today I went to the Vancouver Art Gallery to see the Emily Carr paintings. She willed 157 of her paintings to the Art Gallery in 1945 but most of them are in storage or on loan. However about 20 of them were on display today and coupled with contemporary artists who are depicting similar themes such as the First Nation village life, the forest and the symbology that comes from West Coast First Nations cultures. I think that no one has captured the power, feeling and mood of the magnificent ancient British Columbia forest that was still evident when Emily Carr started painting it almost 100 years ago. Yet even Emily became discouraged about her work and almost stopped painting during the 1920’s. Instead, she earned her living renting out rooms, and making and selling the most god-awful looking pottery souvenirs. I knew that she’d made pots, but hadn’t seen them until visiting the Vancouver Art Gallery today. 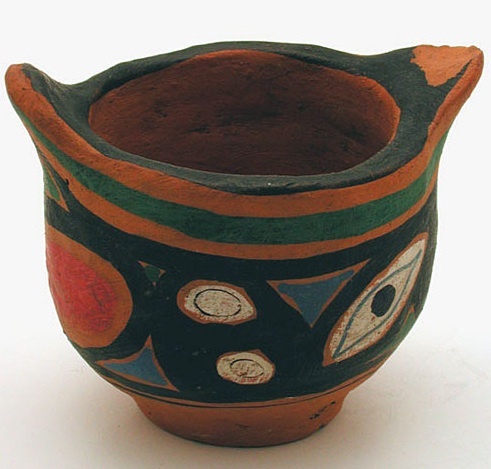 Emily appropriated ‘indian motifs’ in her pots and ashtrays without really understanding the context. The exhibition juxtaposes quilts made by BC author / artist Douglas Coupland who has stitched ‘souvenir’ First Nation motifs into his creations. Coupland has also imagined a dialogue between him and Emily about their work and it plays in the room where the pots and the quilts are displayed. I thought it was a clever way to talk about the appropriation of culture! I wish I could show you photos of the exhibit, but photos are not allowed; the Vancouver Art Gallery does not have paper brochures about their exhibits; the website is also very sparse in terms of description and imagery of their exhibits. I’ve been thinking all day about this wonderful artist who set aside her brushes to create ‘saleable’ ashtrays and dishes. Thankfully Lawren Harris (yes, the Group of Seven Lawren Harris) invited Emily to a show in 1927 that sent her back to her oil paints. I’m thinking that Emily’s period of self doubt is a very good lesson for all of us. Rather than abandoning the art that seems ‘non-commercial’ and trying to make saleable items, like Emily’s ashtrays, we need to follow our passions and stay on course. We must dismiss those doubts and follow our creative hearts even when (pardon the pun) we can’t see the forest for the trees. Hi Flora,Hope you have a marvelous trip out west. I just saw "Winds of Heaven" last weekend, it is a wonderful new documentary about the life of Emily Carr. If you dont see another doc this year, i highly recommend seeing this one. It will further enrich your wonderful visit to the Vancouver exhibit. Hi – Came over from your comment on SilverSpring Studios blog. And stayed to read – love Emily Carr. Discovered her at the Women's Galler in D.C where they were showing her works with Georgia O'Keefe and Freda Kahlo – quite the exhibit! In defense of all artists who make godawful work to sell: unfortunately life requires sustenance, shelter – you know, Maslow's heirarchy before we get to self-actualize. It's a hard tension. My take is it's better to create godwawful than work at a 9-5. Lovely post – thanks! Hi Tammy,That art show you attended sounds like it would have been quite the powerhouse!As for Emily Carr selling ashtrays….what I meant to say is that she had lost faith that any of her paintings could sell and had stopped painting. Then Laurence Harris invited her to a show where she had some exposure to people with the money and interest to buy her work and things took off from there. I think it is entirely possible that she could have earned more money during those 10 years from painting income than from pottery. had she not become discouraged and had she had good representation or marketing skills or networked with friends like Harris.The other part that I found 'shocking' from my 2010 perspective is that she misappropriated First Nation sacred symbols and changed them and actually debased their original meaning and intention. I love Emily Carr and I realise she was a product of her times and environment and cultural (mis)understandings. Had she lived today I have no doubt that she wouldn't have decorated ashtrays with sacred symbols!! Her work in that gallery was paired with Douglas Coupland whose hangings also appropriated First Nations symbolism, but with heavy irony.Thanks for stopping by………I love your 3 dimensional people and masks and your post on New Year's questions vs resolutions. Great food for thought for me!